Valparaiso, a vibrant city, located in Northwest Indiana, provides many things that you’d find in bigger cities while still maintaining the small town feel that I love. It’s a great destination for those who want to escape the hustle and bustle while still having plenty of options. This post documenting a day that I recently spent there barely scratches the surface of everything the city has to offer. Note: Before I get too far into the post let me just address my windblown bicycle hair. Yes, I’ve seen it, and I know it’s crazy! Back to the post now. A stroll through the charming historic downtown presents easy access to wineries, a brewery, creative shops, cultural eats, a park, and theatres. Fun Fact: Orville Redenbacher made his home and built his popcorn empire in Valparaiso. Each year the city draws over 50,000 attendees to its annual Popcorn Festival where over 250 arts and crafts booths and food vendors line the streets. There’s also live music at various stages throughout the downtown during the event. The festival takes place in September of each year. It’s no secret that I’m a big fan of touring cities by bicycle so the city’s newest addition, Zagster Bike Sharing got me excited. I couldn’t wait to test the bikes out. There are eight bike stations throughout the city. Three are within the downtown area, three are near Valpo University, and an additional two located a mile and 2 miles outside of the city. I had quite the squad accompanying me on this all day venture. My friend Carol hates sweating, and Becky hadn’t ridden a bike in over ten years. After mapping out our day’s stops and mileage, we decided to meet downtown to pick up our bikes. I was just excited that everyone showed up after receiving my itinerary the previous night. Although it’s impossible to see and do everything in one day, I like to pack in as much as my friends and family will let me get away with! After getting through the confusion of communication through text messaging and lack of coffee, we were off to our first stop 2.5 miles away. Dagger Mountain coffee sources coffee beans from regions all over the world to roast at their facility in Valpo. The roasting facility is located in a beautifully renovated storage garage. Note: They don’t offer cream or sugar as they want the natural flavor profiles of the coffee to shine through. If that’s not your thing, I recommend that you get a latte. I had the Miel: a shot of espresso, steamed milk, local honey, and cinnamon, the flavors blended so well together. After finishing our coffee break, we took the slow scenic route towards Porter County Museum. The bikes were comfortable in my opinion and made for an easy ride. Porter County is named after Commodore David Porter (only 1% of porter country residents know that) originally from Boston, he was a naval hero of the War of 1812. The city of Valparaiso was named after Valparaiso, Chile where he exhibited bravery in war. Built in the 1860’s the mansion that houses the museum originally was built for the sheriff. Jails attached to the sheriff’s residence were common practice back in the day. The jail is still here. Petty criminals and drunks were mostly jailed in the facility. There are two levels of the museum with many surprising displays and details. I especially enjoyed the room where noteworthy women who’ve lived in Porter County in the past were showcased. The museum is Free to visit, however, donations are gladly accepted. Our next stop was at Furin for lunch. Furin Japanese restaurant is a new addition to the Valparaiso food scene. They serve classic Japanese and modern rolls, sashimi, ramen, and udon just to name a few. We ordered a variety of bento boxes as well as sushi rolls which were reasonably priced for lunch. I’ll have to go back to check out the ramen; it’s my favorite comfort food and I’m pretty picky. I’ve already returned for an additional sushi fix. I was looking forward to our next stop at Four Father’s Brewing for beer flights! I’d worked up a sweat bike riding, and a cold refreshing brew was calling my name. I’d even forgone having a beer at Furin in anticipation of our visit. My friends didn’t follow my lead and proceeded to drink their beers in my face during lunch! Whatever, lol! We got back on the bikes for the 1.1-mile ride to Four Fathers Brewing, well, at least 3 of us did, lol. It was at this time that we lost bicycle Carol…she decided that it was too hot and therefore she was driving. Haha, she lasted as long as she could! Major Fail…..Four Fathers was closed! 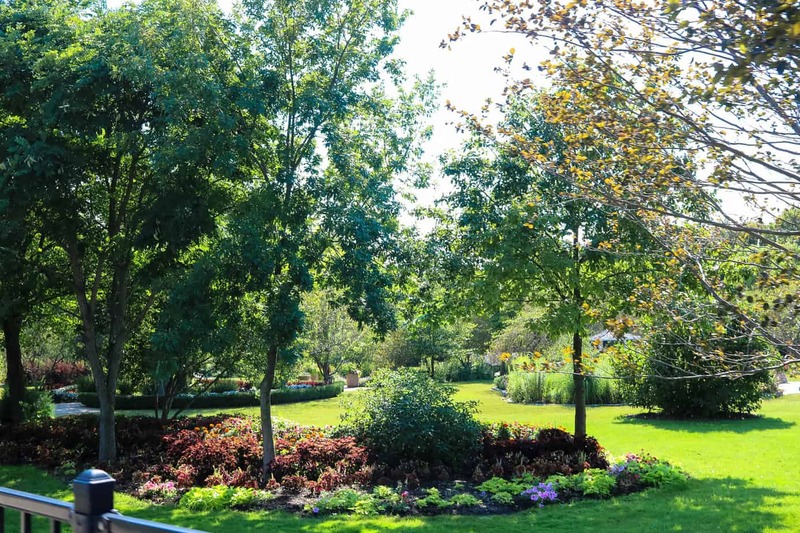 Ogden Gardens is a 4-acre floral display area showcasing annuals, perennials, rose gardens, shrub beds, and many varieties of trees. The Japanese Garden has trails, streams ponds; a tea house and koi pond for visitors to enjoy. It’s beautiful and peaceful. We spent a great deal of time there among the serenity and colorful beauty. Now back to Four Fathers for a nice cold flight….We lost another bike rider; Becky! Beer Time!……….NOPE! Four Fathers was still Closed….I really couldn’t believe that we made the same mistake twice. Maybe the heat was getting to us, it was actually quite funny at this point…at least to me it was! We rode back into the downtown for a tasting at Misbehaving Meads, more exploring, and some shopping. Meads aren’t classed as beer or wine but are in their own class like ciders. My favorite from the tasting was Zasparilla. Great stop! There are many unique shops to peek into while visiting downtown Valpo. Lifestyles has always been a favorite, but there’s an abundance to choose from. If you don’t recall anything else, just remember Four Father’s taproom doesn’t open until 4 pm. It was my first visit to this brewery. I lit up when I saw the popcorn machine and then to find out that it’s made with bacon grease, Yes! They also offer other light snacks like pretzels, nuts, and jerky. I liked the feel of the taproom and the personable staff. The flights are also very generous, and boy is their beer strong. I don’t know where to begin when discussing the craziness that ensued here! We all had a great time and it was worth the three trips! Needing food after visiting Four Fathers we stopped in at Main & Lincoln. I’m in favor of any restaurant that allows you to park at the counter to watch the skilled choreography that happens in the kitchen. Becky and I split the ribeye; it was so tender and well seasoned! I don’t generally go for steaks often, I’m more of a seafood lover. I’m glad I switched it up, I plan on bringing the husband back here. The oysters and calamari are also good choices. Main and Lincoln is open Monday-Friday at 5 p.m. for dinner. By this time, the day was catching up with us and we were exhausted! I had 2 additional stops on the tour that my friends squashed, lol. You can’t however, end a day in Valpo without stopping in for a sweet treat at Designer Desserts. I did make it there! So many delicious flavor combinations make one go a little crazy! My standout was the Double D: chocolate cake swirled with peanut butter and Butterfinger pieces, then swirled on top with chocolate and caramel fudge sprinkled with Butterfinger pieces, and chocolate covered pretzels….heavenly! It was a nice end to a memorable day. This was only a glimpse into the many offerings of Valparaiso. There’s much more to do and eat! It’s a wonderful city full of great people! The location makes it an easy day trip from Chicago or Southwest Michigan. Maybe even stay a few days to explore! Have you been to Valparaiso? What are some of your favorite things to do? OMG… my favorite post!!! Hahahaha….thanks for the shout out to my sweating hatred! LOL. Love you. lol, anytime! Thanks for always being down for a crazy day! Love you too. I had no idea there was so much to do in Valparaiso! I’ve only heard of it but never been there. Thank you! You’re welcome! It seems like there’s always something new in Valpo. It’s a fun city! Hopefully you’ll get to visit soon. This post had me cracking up and craving for this adventure all at the same time. Loved it! Hahahaha, glad you liked it! What a great adventure you had in my home town! I moved to Arizona a few months ago and really miss it sometimes. Although not in town I really love the Taltree Arboretum. For a really good organic treat try Roots. I’m not a real big fan of these kinds of places but this one was so good! Also don’t forget about Parea for dinner. The lamb chops are amazing! Thanks for the recommendations, I love your hometown. I was able to attend a concert at Taltree Arboretum for the first time this past summer and fell in love. Roots has been on my list but I haven’t tried it yet. Will make sure to check it out soon. I’ve been to Parea but haven’t tried the lamb chops. That surprises me since I love lamb! Next time for sure. Thanks for your comment!